LBD & ONESIES - A Lifestyle Blog: So Chic Giveaway c/o Cichic.com! 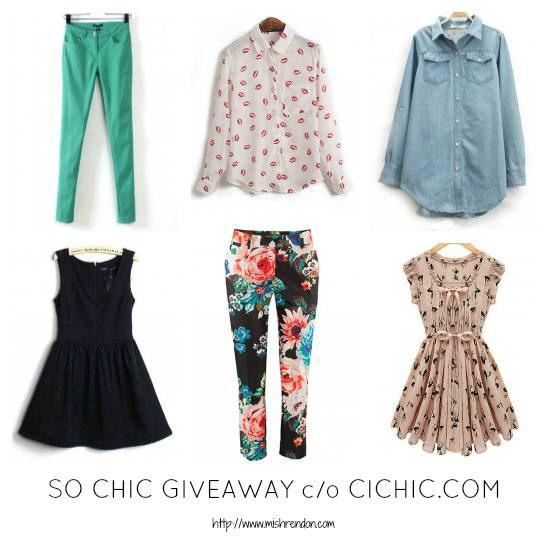 So Chic Giveaway c/o Cichic.com! It's been a while since I last had a giveaway. :) I used to have them every month. Lol! Anyway, this one is brought to you by Cichic.com. The giveaway will run from April 14 to May 5. Prizes will be shipped directly to the winners by Cichic.com. Would like to have this for me and my mom respectively. Amazing giveaway, I love these. So exciting, Cichic has great clothes and i'd be thrilled to win! I'm a sucker for classic pieces so these two were my top picks! Just because I really can't afford any of these beautiful things <3. Are the two I'd most like to win. Oh I hope I'll win! Wow, it's pretty hard to choose just 2! Awesome giveaway. Thanks for doing it! was really hard to choose only 2! 1. Ivory white belt lapel sleeveless midi chiffon dress. 2. Beige patchwork double deck falbala sleeveless chiffon dress. so many cute clothes, i can't pick!! Thank you very much! I hope I win!